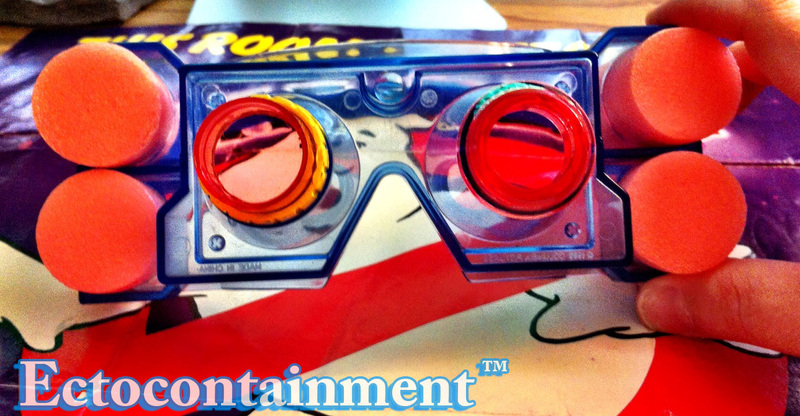 I’ve owned two Kenner Ecto-Goggles/Ecto-Popper since 2011. Neither were mint in box and it took buying two of them (not the original plan) to make my current and only Ecto-Visors as complete as possible. Neither toy or inserts were in any plastic bagging. I’m pretty sure Kenner once included a paper instructions sheet for them. What I’ve done is try to recreate a un-boxing experience how I could so we could enjoy Kenner’s Ecto-Goggles, even long after we may own Matty Collector’s version. I took 14 pictures and scanned each side of the original box. As an added bonus you can print out Mr. Stay-Puft for collectibility or to use with your own Kenner toys and prop replicas.